its origin, progress, work, and wants / published by order of the Board of Managers. Board of Managers to the Hospital. Philadelphia : J.B. Lippincott, 1869. Description : 47 p., 7 leaves of plates ; ill.: plans, front. engrav., plates ; 20 cm. Photographs : 6 mounted albumens on heavy stock. Photographer : John Moran (attributed). Subject : Hospitals — Civil War. Bound in green buckram, gold stamped image of the hospital on cover. Ornate gold stamping on spine. The misery of the men, in many cases covered with mud, and with terrible wounds untouched for days, and their delight in getting into what seemed to them like a Paradise, were alike beyond the powers of description. The new building was thus used for nine months, until the Government provided hospitals of its own. The Medcial Board rendered their services without fee or reward. Churches undertook the providing of cots and furnishings. Liberal supplies for the patients, in the shape of books, clothing, articles of diet, lint and bandages, were poured in from many Christian helpers. Miners on the Schuykill sent a liberal donation of one hundred and ninety-five tons of coal. And Christian women were untiring at the bedside of the wounded in the countless services of friend and nurse. — page 18-19. This slim volume constitutes a history of the hospital with an appeal for donations to build an East wing accorded by Sloan's original plans. AND SOUTHERN PART OF THE WEST WING. No. 7. 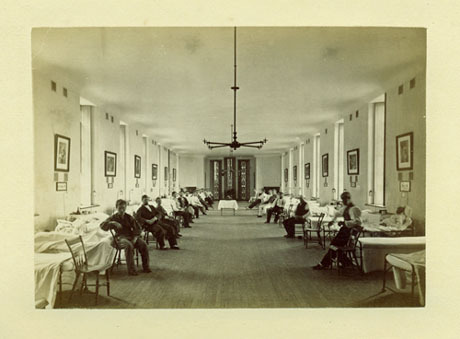 — HOSPITAL — INTERIOR OF THE MEN'S SURGICAL WARD. 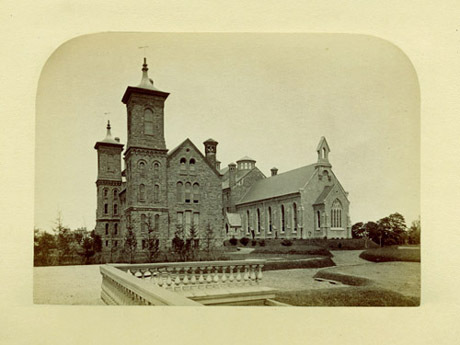 John Moran achieved renown for his landscape photography and his serviceable images recording Philadelphia architecture. Attribution of the photographs in this volume is inferred from similarities to the documentary images he made of the Mower Hospital in 1863. He was also distinguished as the brother of artists Edward and Thomas Moran, the "dean of American painters," who is remembered for his canvasses of Yellowstone National Park. In 1871 Moran replaced Timothy O'Sullivan as the official photographer for the second Panama Canal expedition.